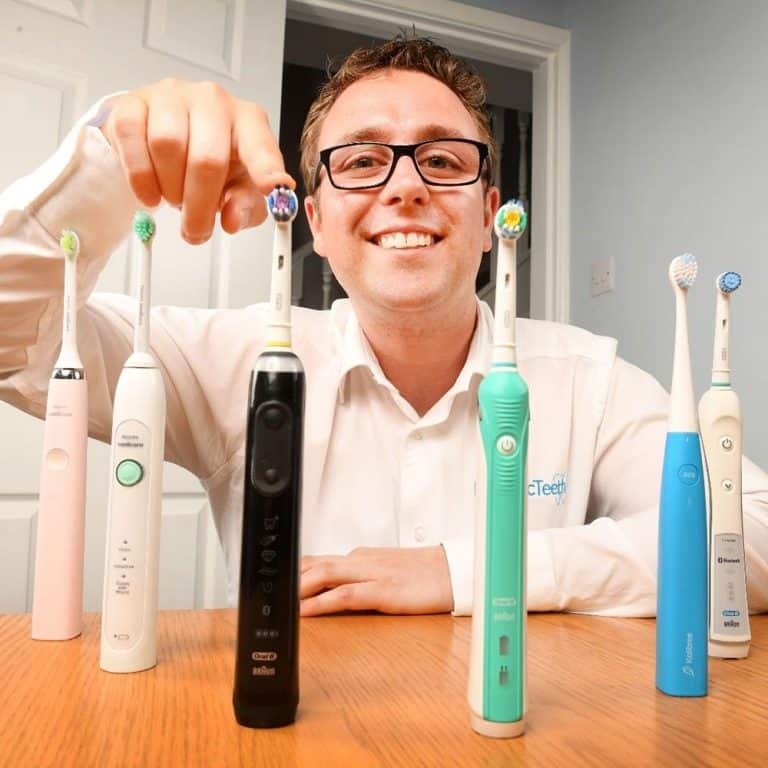 To learn the best way to whiten your teeth, read our article on the best whitening methods which explains all you need to know, or to see our full range of whitening content, visit our teeth whitening hub page. If you really are set on buying a charcoal toothpaste or powder, we recommend first checking out our best charcoal toothpaste article. Beverly Hills Formula Perfect White Black works by removing surface stains and may make your teeth appear whiter, but it will not change the natural colour of your teeth. The results you achieve by using Perfect White Black will be different to me. A 100ml/130g tube of this paste costs on average £4.99. Within the UK this paste is widely available form good pharmacies and health stores such as Lloyds Pharmacy as well as online retailers like Amazon. I am not sold by the packaging, I think it could be smarter and more appealing, but it has all the information you or I need and is not too busy. They even make reference to the RDA scale and low abrasive nature of the paste on the outer box. Whilst it says it can offer ‘perfect stain removal’ and ‘low abrasion’ it also says ‘activated charcoal helps combat bad breath’. What I like here is that the properties of charcoal are being considered just beyond the possible whitening and how it can help with breath too. Whilst activated charcoal may have the ability to whiten teeth for some, what makes charcoal effective in many instances is the properties it has at absorbing microscopic molecules, including the bacteria that cause bad breath. It is, therefore, refreshing to see Beverly Hills promoting some of the other benefits of including this in their paste. Activated charcoal is perhaps most effective used in the natural form that is a powder. Many products exist ranging in price from just a few £ right up to about £25, with no discernable difference between them. The problem is, the powder, although very fine, can be abrasive and not the most pleasant to use on the teeth. The taste is also quite gritty and earthy and not the minty freshness you might be used to. It the powder form, unless mixed with other ingredients, it lacks the beneficial items like fluoride, which leading dental organisations feel are very valuable to your overall dental health. Thus a paste with the addition of charcoal is more appealing for many. It is less messy for a start. Beverly Hills Formula Perfect White Black is just that. Most whitening pastes, including this one, actually only work harder to remove stains and discolouration from the teeth to restore natural whiteness. Therefore they whiten teeth through cleaning them better than actually bleaching them white as a cosmetic dental procedure might. This is an important distinction to make as those with no staining on their teeth, will see no improvement from such pastes. 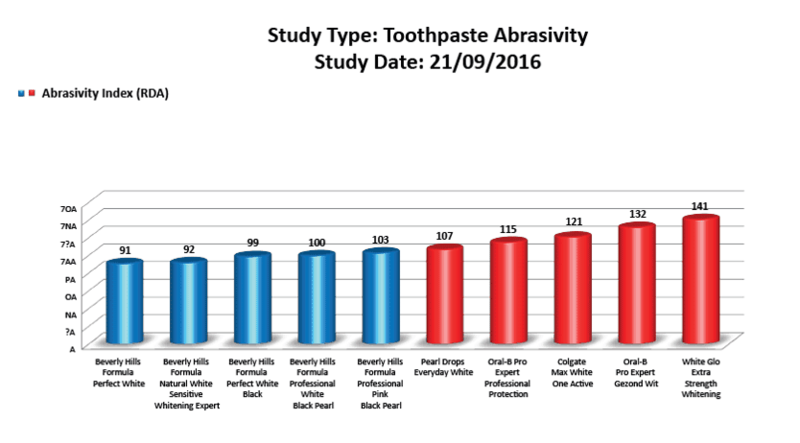 You might also be interested to know that a recent Supershoppers test found that there is little difference between the amount of stains removed by a whitening toothpaste, such as this, compared to a regular toothpaste. We cover this more in our post on the best whitening toothpaste. The tube is 130g in weight and contains 100ml of paste, which should last about 3 months. It has a shelf life of 12 months once opened. It has a screw cap rather than my preferred flip lid. It does however stand upright on its lid which is a bonus. When first used, it does have a foil cap on the tube that needs to be removed. Apply a pea sized amount of the black coloured paste to your brush and proceed with brushing for 2 minutes. It is not essential, but like you might with a charcoal powder, if after 2 minutes of brushing you can leave the paste on for a couple of minutes, this can help clean stains more effectively. As the formula is brushed onto the teeth, the dark colour turns to a very frothy light grey/white foamy solution. I found it to be a little too frothy, but there was a nice minty flavour and I got a nice zesty freshness after each clean. My teeth certainly felt clean and after spitting out I did not have a gritty residue that required a lot of rinsing or another brush like a charcoal powder would. The paste itself is smooth and I noticed no texture to it. I should also point out it’s less messy than a charcoal powder. Whilst I suffered no side effects from use, if you do, stop using and consult a dentist for further advice. At around £4.50 a tube, whilst more expensive than the most basic of toothpastes, it is cheaper than many of the more premium whitening pastes. I think given the money back guarantee, the openness of the RDA rating and the overall paste quality, this is a very fair price. Endorsed by Dr Kinsella of Re-Enhance Clinics, is there extra confidence to be gained from a professional dentists backing? There is a money back guarantee for added peace of mind, should you want to make use of it. Limited to one per household, you need to return the product with the original purchase receipt to the address given and you will be refunded the price you paid if you are not happy with the product. Aqua, Sorbitol, Hydrated SIlica, Glycerin, Pentasodium Triphosphate, Tetrasodium Pyrophosphate, Sodium Lauryl Sulphate, Aroma, PEG-32, Cellulose Gum, Sodium Fluoride, Cocamidopropyl Betaine, Sodium Saccharin, Charcoal Power and Limonene. Charcoal, or more specifically activated charcoal that is used within this product is a natural product made from coconut shells, that has a natural porous structure that makes it good at absorbing impurities. For many years it has been used within medicine, in the Asian traditional medicine in particular; but even in more modern medicine charcoal can be used in cases of poisonings as it absorbs the toxic chemicals that make you or me ill.
Whilst it has been around for years it is only recently that is has become more prevalent within the dental and beauty space. Concerns have been raised over the long term safety and suitability for use on peoples teeth, we talk more about that in our guide to charcoal toothpaste. Unlike some other charcoal products on the maket today, Beverly Hills Formula has been tested and given an RDA value. RDA stands for Relative Dentin Abrasivity and is a scale by which products are rated based on how abrasive they are to the tooth surface. Now I probably don’t need to tell you that generally, you want a paste that is low in abrasivity to protect your teeth. However, you might expect a whitening paste to be higher up the scale and worth using now and again. Most manufacturers aim to be around the 100 mark as more concern arises when exceeding this. No manufacturer of any of the charcoal powders we reached out to were able to advise how abrasive their charcoal was. It has been only Beverly Hills Formula, made by Purity Laboratories, that upon questioning how abrasive the paste was, without request specified with graphic evidence their paste on the RDA scale. Perfect White Black came in at 99. With the rating said to have been verified by independent universities. Therefore within the scale for medium abrasivity this is impressive. Whilst some will still question its safety for everyday use, with a fairly low score it is certainly one of the better ones to use, purely because we know what the RDA value is. This is not considered an eco-friendly product, particularly when toothpaste tubes like this are so hard to recycle, most end up in landfill. However, to avoid creating unnecessary waste it is worthwhile familiarising yourself with this product as best as possible before deciding whether it is right for you. Many people have purchased products like this, thinking it is right for them. However, after a couple of uses they realise they don’t like the taste or it doesn’t work as expected and ultimately it ends up in the bin, resulting in a waste of money for you and resources for the environment. The brand manufacture and market a number of other toothpastes and mouthwashes under their perfect white and professional white range. Whilst the ingredient makeup of these pastes and oral rinses may well be different, as is the case with the Perfect White Black toothpaste, the products can only ever remove surface stains and none will actually change your natural tooth colour. As things go, Beverly Hills is doing a fairly good job. What I would like to see improved is something that the industry as a whole needs to get better at and that is more transparency and education to help the public and buyers of the paste really understand the nuances of teeth whitening. Toothpaste and poweder will only ever remove surface stains (unless they contain a peroxide/bleach). Thus, the whitening is actually stain removal. Whatever the so called ‘whitening’ results I have to give praise to the fact that Beverly Hills Formula has and they actively promote the RDA value. It might not be the lowest, but it is far from the highest and well within safe limits. They also don’t overly promote the stain removal or whitening effects and actually focus on the potential benefits to bad breath. A good value tube of paste, endorsed by a leading dentist that is simple to use and a lot less hassle than a powder. If you want to try a charcoal toothpaste, but fancy a less gritty and messy experience, then Beverly Hills is one of the better options to date in my opinion. 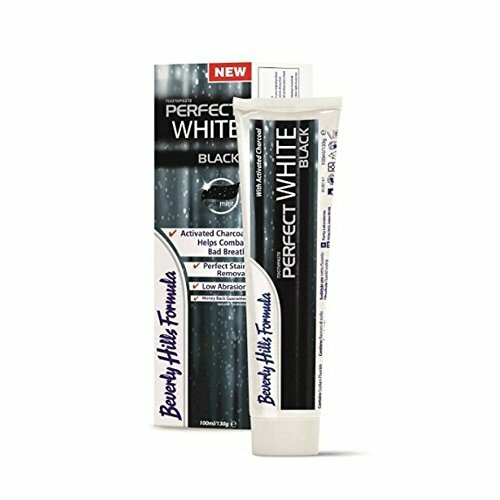 Where can I buy Beverly Hills Formula Perfect White Black toothpaste? It is available from pharmacies such as Lloyds and Rowlands as well as supermarkets such as Morrisons, not to mention Amazon. What are the ingredients in Beverly Hills Formula Perfect White Black toothpaste? There is a distinct mint flavour. A pea sized amount, like a regular toothpaste. I had no sensitivity, pain or side affects from using this. Should you should gain additional sensitivity or side effects as a result of using it, stop doing so and consult a dentist. A tube like this should last about 3 months. Is it safe? / Does it damage the enamel on my teeth? Whilst from an industry perspective more needs to be done to verify the safety and long term consequences of using charcoal based products on the teeth, Beverly Hills have conducted tests and shown that the RDA of this paste is 99. This puts it well within safe limits for daily use. It is the only brand of the ones we reached out to, that volunteered such data. Do you own or have you used the Beverly Hills Fromula Perfect White Black? Charcoal toothbrushes: what are the benefits and what is the best one? Hi Jon l have just bought some BHFPWB toothpaste as well same manufacturer mouth wash l have only been using for two days so obviously don’t know what results will be yet but l wondered after your research on other whitening pastes which is the one you found to be the best one incidentally l do use a electric toothbrush as well many thanks look forward to hearing your reply Charlene Dunn. In all honesty picking a ‘best’ one is very difficult as so much is personal. The more abrasive pastes tend to be more effective in a shorter period of time, but are not recommended long term. Much depends on the individuals teeth, diet, lifestyle and if external stains on the tooth are the actual cause of any tooth discolouration. A regular toothpaste (not whitening) and a toothbrush, are generally as effective as many whitening pastes. If you stay tuned to the site, in the next few weeks we have a full and detailed guide to teeth whitening, including the use of toothpastes coming, that will explain it all in more detail.